Babblings of a Mommy: Target Wants To 'Wu' Us Next Feburary. Target Wants To 'Wu' Us Next Feburary. Guess, who the next Target collaborator is? Yup, Jason Wu. (How exciting!!) Wu has a very refined lady-like aesthetic, so I can't wait to see what his collection will look like. Even Michelle Obama has a soft spot for Wu and wore his design the night of the inauguration back in 2009, remember? Well, unlike the vast Missoni for Target collection, Wu's Collection will only include apparel and accessories that will range from $19.99 to $59.99 for apparel and $19.99 to $49.99 for handbags. It seems Target is pretty excited about this collection too--just hours after breaking the news they released the above sketch from the collection. (Very Audrey Hepburn, don't you think?) And now they just released this video teaser that gives us a glimpse into the collection and the inspiration behind it. What do you think of Jason Wu for Target Collection? Are you excited? VERY excited! 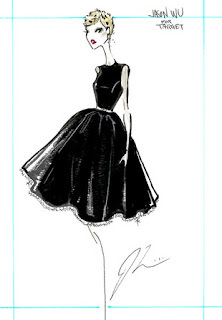 I love Jason Wu! Can't wait. I love that target pairs up with all these designers to give us affordable fashions. Can't wait! Krista: Love him too! Can't wait to see more. Amy: Me too. Target has definitely won me over with all the collaborations they've been doing.